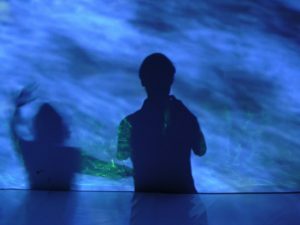 Entre des Eaux is a cooperative work between the audiovisual artist Claudia Robles and the multimedia activist Ralf Haarmann. The central element is water, like the flow of the relationship involving the concepts of abstract-concrete-abstract, etc. ; an action without a beginning or an end. The performance connects two perspectives: while Robles uses water images to generate and manipulate the video in real time, Haarmann creates music based exclusively in the sounds of the water. Throughout the whole performance the two perspectives flow parallel and sometimes they connect, building a very flowing audiovisual dialogue.